Chinese top political advisor Yu Zhengsheng underscored the Communist Party of China (CPC) leadership on Monday as the country "enters the home stretch" for its 2020 goal. Addressing the closing meeting of the annual session of the National Committee of the Chinese People's Political Consultative Conference (CPPCC), Yu said China is at a decisive stage in the journey toward building a moderately prosperous society in all respects by 2020. "The curtains of history have been lifted and the arduous tasks have been bestowed on our shoulders," Yu told more than 2,000 fellow advisors. He said the country is "sure to claim victory" under the CPC leadership, with the advantages of socialism with Chinese characteristics, and based on the solid material foundations over the past decades. China has set 2020 as the target year to double its GDP and per capita personal income from the 2010 level before the CPC marks its 100th anniversary of founding in 1921. According to a draft of the 13th Five-Year Plan for Economic and Social Development, which was submitted to the national legislature earlier this month, has been deliberated by lawmakers and is expected to be approved on Wednesday. The plan sets average annual GDP growth target at above 6.5 percent from 2016 to 2020. Yu, to this end, told political advisors to focus their work on providing suggestions on and making contributions to the country's development during the 13th Five-Year Plan period, and on the 2020 goal. They must make in-depth research, focus on political consultation, and step up effective oversight, in order to offer more insightful suggestions and pool strength for building a moderately prosperous society in all respects, he said. 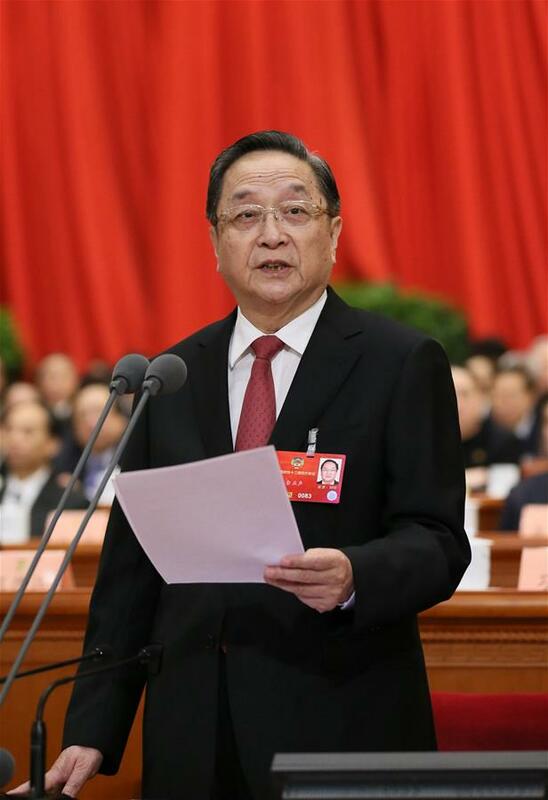 The top political advisor urged CPPCC members to uphold the system of multi-party cooperation and political consultation under the leadership of the CPC, and adhere to the concepts of innovative, coordinated, green, open and shared development. They shall become more aware of the need to uphold political integrity, keep in mind the bigger picture, and enhance the sense of duty, Yu said. A political resolution adopted at the meeting also underscored that the "consciousnesses of the ideology, the whole, the core and the line" must be promoted. This concept, dubbed "the four consciousnesses," was raised earlier this year at a high-level meeting of the CPC Central Committee. The five concepts on development and the strategy of innovation-driven development must be fully implemented, the political resolution read. It also called for enhanced efforts to cut overcapacity and excess inventory, deleverage, reduce costs, and strengthen points of weakness. The CPPCC is a patriotic united front organization of the Chinese people, serving as a key mechanism for multi-party cooperation and political consultation under the leadership of the CPC. Seen as a major manifestation of socialist democracy, the CPPCC serves to conduct political consultation, exercise democratic supervision and participate in the discussion and handling of state affairs. On Monday, the national political advisors also approved a report on the work of the Standing Committee of the 12th CPPCC National Committee over the past year, and a report on the proposals submitted by CPPCC National Committee members to the annual session this year. Chinese political advisors' proposals are sometimes considered a rough barometer of public opinion and telegraph the general national agenda for the whole year and beyond. This year, national political advisors submitted 5,375 proposals. Among them, 4,248 have been formalized after being reviewed and 824 were listed as opinions and suggestions. Of the total, 42 percent centered on economic affairs and 10.5 percent on political issues. Proposals on social affairs and ecological progress accounted for 31.4 percent and 9.8 percent respectively. Political advisors proposed advancing supply-side structural reform during the 13th Five-Year Plan period (2016-2020), alleviating the tax burdens on enterprises, implementing an innovation-driven development strategy, developing e-commerce in rural areas, strengthening treatment of air, water and soil pollution, and others. The proposals will be given to 164 government bodies to handle after the session, and the CPPCC National Committee will select key proposals to work together with related departments and individuals who raise the proposals. "New normal" of economic development discussed during "two sessions"